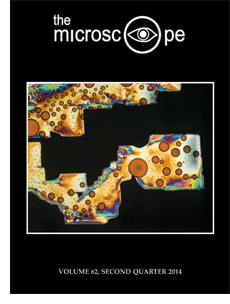 Excerpt: One of the benefits of editing The Microscope journal (and there is a handful of them) is the opportunity to view a wide range of photomicrographs submitted to us by our authors. Their images accompany the articles that we publish here and are an integral complement to the words describing the long hours of research that these papers represent. As many of you are well aware, looking through a microscope reveals the many subtle beauties of the “invisible world.” The countless specimens, both natural and man-made, that have been studied over microscopy’s long history, through the single lens microscope, the light microscope and electron microscope, all reveal their own unique aesthetics of light, color and natural composition. Substances usually perceived as unattractive to the naked eye are often sources of some of the most attractive photomicrography. Abstract: Microscopical methods permit the pigment particles responsible for color and effects in paints, inks, polymers, rubbers and cosmetics to be directly and readily observed, both in situ and ex situ. Using examples of pigments in paint, fibers and cosmetics, this research will demonstrate practical sample preparation and imaging methods that permit detailed visualization and utilization of pigments as evidence in forensic and industrial examinations. Preparation methods covered here range from the efficient (smears) to the traditional (cross sections) to the state of the art (ion-polished cross sections), while imaging methods spanning length scales of millimeters to nanometers, which include polarized (PLM) and oil immersion light microscopy as well as scanning (SEM) and transmission electron microscopy (TEM) will be demonstrated. Not only does such analytical information provide for the opportunity to make observations impossible by more routine, indirect forensic approaches (such as paint comparisons by infrared spectroscopy) or the casual application of magnification that is common in many laboratories (e.g., stereomicroscopy of paint chips to determine layer structures), but it opens the possibility to find true differences in the finest components of materials, which may be suggestive of a specific manufacturer, batch difference or quality issue. Finally, the resulting images provide a simple and visually compelling means by which to convey such similarities or differences to a lay audience or jury. Excerpt: Everybody knows the light microscope as the symbol of science — the universal touchstone that people immediately associate with high-end scientific research. But there is another side to this coin that is rarely discussed: Most of what we’re told about its origins is wrong. When people look back at the development of the microscope, they downgrade its practitioners and their skills in a uniquely patronizing fashion. It doesn’t happen anywhere else in science. The work of the early astronomers is described with awe, pioneering surgeons are admired for their courage and dexterity, groundbreaking engineers are regarded as brave pioneers, and every physicist is a genius. But not the early microscopists. They are portrayed as inquisitive amateurs, who simply slashed into a few plants and got lucky. Abstract: This study is a continuation of efforts to assist criminalists in sorting glass fragments with similar colors that might have originated from different sources. The topic is of particular interest when multiple glass fragments in question are collected under a single item number and submitted for analysis and are compared with known glass fragments. From a criminalist’s point of view, each questioned fragment is an individual item of evidence, and each fragment must be examined to determine if it can be distinguished from others within the same questioned item number. Color is a logical starting point for distinguishing many glass fragments, but color can present a less-than-ideal feature due to the varied sizes and thicknesses of fragments that can make visual color comparison inconclusive. The application of microspectrophotometry (MSP) to the partial resolution of this problem can make fragment color sorting more definitive, but the irregular shapes of glass fragments and their large refractive index (RI) difference relative to air makes an immersion mounting technique necessary prior to MSP analysis. These analytical issues were resolved and the MSP sorting technique was applied to a group of 25 green bottles. Some initial work on this topic was done on wine bottles and other glasses and was presented for discussion at American Academy of Forensic Sciences (AAFS) in San Antonio, TX in 2007, Inter/Micro in Chicago in 2007 and the Scientific Working Group for Materials Analysis (SWGMAT) in Fredericksburg, VA in 2008. An earlier application of this instrumental technique for the detection of synthetic and fake gems was presented at the AAFS meeting in New Orleans, LA in 2005. The current work analyzes green glass samples not used in the previous studies. Originally published in The Microscope and Crystal Front, Vol. 14, No. 6; September – October, 1964. Excerpt: Although fusion methods are excellent for identifying organic substances and show considerable advantage over other methods, they are not indispensable to this field. The case is different in the study of isomorphism and polymorphism of organic compounds. Here one can assert with a clear conscience that thorough investigations of the isomorphous relationship of two substances, which also extends to polymorphic modification, is impossible without a hot-stage microscope. X-ray or IR-spectroscopic investigations provide a useful supplement, but cannot by themselves give a true picture of the various possibilities of isomorphism and polymorphism, although the two concepts, isomorphism as a similarity of form and polymorphism as a multiplicity of form, at first appear contrary, they are closely related. I shall attempt to show this in my presentation. Excerpt: The E5 Series biological microscope by Sunny Instruments features reliable quality and easy operation practical for young microscopy students. These inexpensive microscopes have excellent performance and a clear image that will inspire students’ interest in microscopy and life sciences. 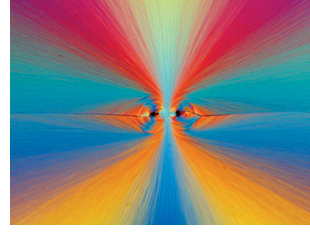 Copyright © 2014 Microscope Publications, Division of McCrone Research Institute. All rights reserved.